Once upon a time there was sweet little girl. 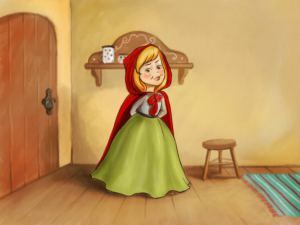 Everyone called her Little Red Riding Hood, because she always wore a red riding hood. It had been given to her by her grandmother, who loved the little girl very much. 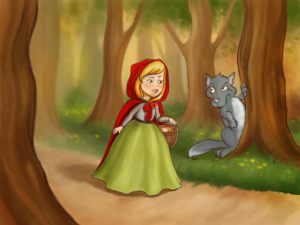 Little Red Riding Hood’s grandmother lived half an hour away in the woods outside the village. So Little Red Riding Hood set off. 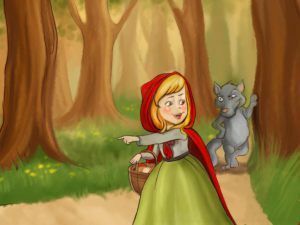 The girl had just entered the woods, when a wolf came out of the trees. She wasn’t scared because she didn’t know wolves are dangerous. “Good day, Little Red Riding Hood”, the wolf greeted her. “Good day, Mr Wolf”, the girl replied. “Where are you going?” he asked. 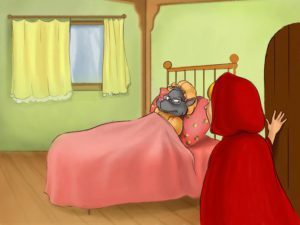 “I’m going to visit my grandmother, because she isn’t feeling very well”, Little Red Riding Hood replied. “What do you have in that basket?” asked the wolf. “I have some bread, butter, cake and berries to take to grandma”, she replied. “Excellent! 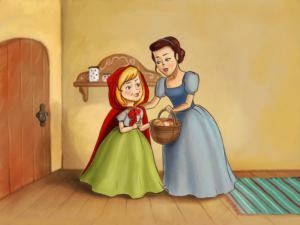 And where does your grandmother live?” asked the wolf and Little Red Riding Hood explained exactly where her grandma lived. They walked together for a while. Then the wolf spoke again. “What lovely flowers there are here! Why don’t you pick some for your grandma?” The girl looked around and saw all those beautiful flowers. She thought that her grandmother would be delighted to have some fresh flowers and, despite her mother’s advice, she left the path. 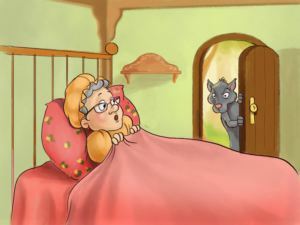 The wolf entered the house, went to the old woman’s bed and ate her whole. Then he put her clothes on and slipped into the bed. 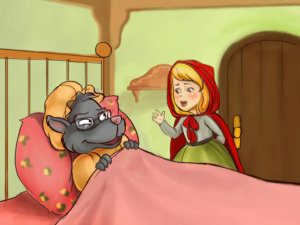 When Little Red Riding Hood arrived at her grandmother’s house, she noticed that the door was open. The girl went in and went to the bedroom. Usually she felt very happy at her grandma’s but that day something felt different. “Good morning!” she said, but no one replied. Her grandmother looked strange. 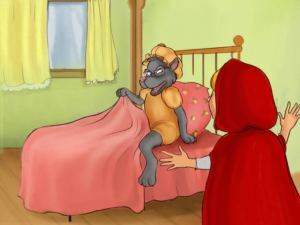 “Oh, Grandma, what big ears you have!” exclaimed Red Riding Hood. 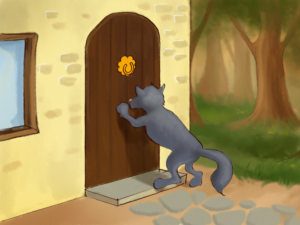 “All the better to hear you with!” the wolf replied in a fake voice. “Oh, Grandma, what big eyes you have!” she continued. “All the better to see you with!” the wolf said. “Oh, Grandma, what big hands you have!” “All the better to grab you with!”, the wolf said. 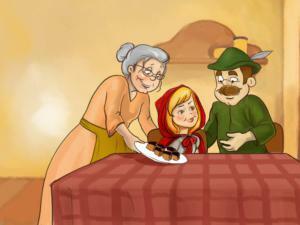 “Oh, Grandma, what a big mouth you have!” exclaimed Red Riding Hood. 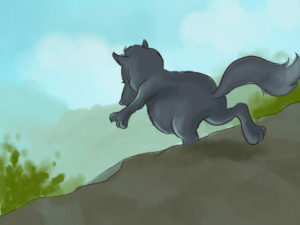 “All the better to eat you with!” The wolf roared, jumped off the bed and ate the poor girl whole. 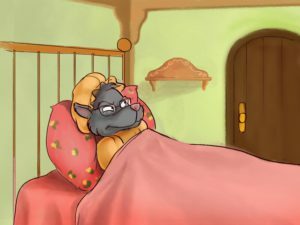 With his stomach full, the wolf got back into grandma’s bed and fell asleep, snoring loudly. A huntsman, who was passing by the house, heard him and thought it was very strange for the old woman to snore so loudly. 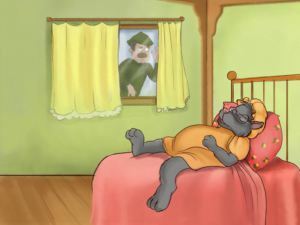 He looked inside and saw that it was the wolf who was snoring. The huntsman had been looking for the wolf for a long time. At long last he had found him! 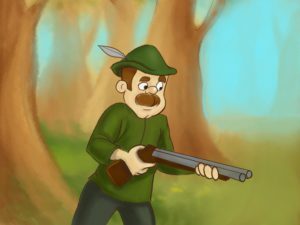 The huntsman lifted his gun and was just about to shoot, when he had a thought. Maybe the old woman was still alive inside his belly! So the man took a pair of scissors and cut open his belly. He saw a red hood popping out and then Little Red Riding Hood jumped out. 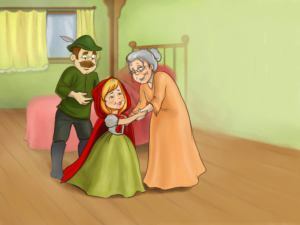 The huntsman cut a bit more and the grandmother came out, too. Little Red Riding Hood gathered some stones and they filled the wolf's belly with them. When he woke up, he was scared and tried to run away but the stones were so heavy that he fell down dead. The three ate some cake, happy in the knowledge that the wolf was not going to be a danger anymore. 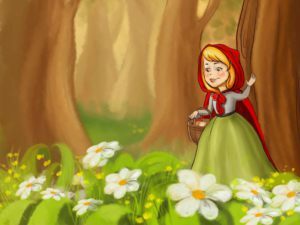 Little Red Riding Hood decided never to leave the path again and to listen more carefully to what her mother told her.